“Old Lions” by Geoffrey Robinson begins when Kelly Philips-Burton, the daughter of Jim Phillips, a long-retired Special Operator, witnesses an armed robbery of a Brinks armored car parked in front of the Lexington Market to collect the day’s cash receipts. Kelly was able to get the license plate and a full facial view of the guy sitting in the front passenger-side seat. There was a problem though, in that guy was also able to look Kelly directly in her eyes at the same time. Kelly decides to report her witness to the police, who invites her to go to the station to try to identify the man she saw from the mug books. Kelly agrees and is able to identify the man. But later when she is threatened, the law constrains the response of the police. This is when her father Jim, and his retired military buddies know that one more Op is in order. Armed with the inconspicuousness of age, and their military skills, old friends gather to defend their friend’s daughter from the threat she is facing. Geoffrey Robinson’s writing style is spot on with action, and character development. The plot in itself is thrilling and entertaining, making the book difficult to put down. I truly enjoyed the interaction of the old military buddies between themselves, as well as when they confront danger. The action described and the characters personalities felt real, keeping me at the edge of my seat on many occasions. It is definitely a well-written thriller. 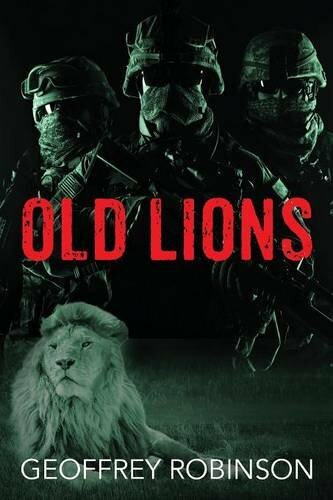 Overall, “Old Lions” by Geoffrey Robinson is an awesome read with the right amount of military knowledge, plotting, action, and character development, to produce an entertaining, thrilling ride for readers. I truly recommend it!